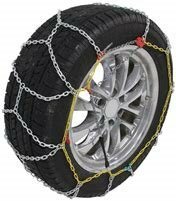 These square-link, diamond-pattern tire chains provide excellent traction in snow and ice for vehicles with limited wheel well clearance. Made of a durable and corrosion-resistant manganese nickel alloy with built-in tensioners to ease installation. Features:Sturdy, durable alloy tire chains give you extra traction in snow and ice. Square links form cross chains◦Great traction in snow. Excellent grip and stopping power on ice. Small link size contributes to a smooth ride. Diamond-pattern chains offer more tire coverage◦Increased traction and stopping power when driving forward and during turns. Quick and simple manual installation with assisted adjustment◦Integrated tensioners let you control the fit of your chains.